ROGUE & GAMBIT #5. Cover. Image Courtesy of Marvel Entertainment. If you’ve been a loyal reader of ROGUE & GAMBIT, you have followed our titular heroes on their undercover mission to the mysterious island of Paraíso. There, they faced new villains, clones of themselves, and unexpected encounters with the past. 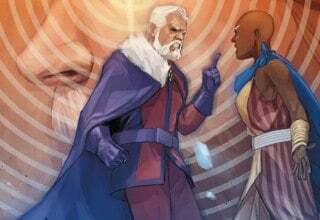 ROGUE & GAMBIT #5 features the conclusion of Kelly Thompson, Pere Perez, and Frank D’Armata’s hit miniseries, and though it is abundant with action and entertainment, the issue’s best moments lie in its final pages. 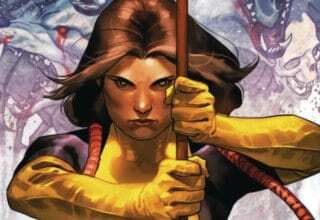 The first grand Marvel moment lies in the sequence where Rogue absorbs the abilities of Dr. Charmaine Grand. As a result, Rogue transforms into a powerful angel-devil-looking-hybrid. Maybe that’s a poor description, but you’d just have to see it to believe its awesomeness in both the artistry and context of the story. Now, the moment that may linger with readers comes at the issue’s conclusion. Those pages ultimately feature Rogue and Gambit’s decision to continue their relationship despite the series of obstacles they have faced as well as each of their mistakes in the past. It is a light-hearted way to end the series and one that will certainly satisfy Rogue and Gambit shippers. So, if you are looking for a positive, uplifting work to potentially get your mind off of AVENGERS: INFINITY WAR, ROGUE & GAMBIT #5 is the work that can lift your spirits. YOU ARE DEADPOOL #1. Variant Cover. Image Courtesy of Marvel Entertainment. It’s safe to say that YOU ARE DEADPOOL #1 may not appeal to all readers. However, the issue as a whole is making our list of Unsung Marvel Moments due to its bizarre originality. As Deadpool states himself, the work is “an interactive comics experience” in which the reader gets to decide what Deadpool does. How is this possible? Well, Deadpool continuously prompts the reader to select his next move. Their selection then results in a panel number that comprises the next stage of the narrative. Again, some readers may find this “interactive comics experience” confusing. Others may find it to be exceptionally entertaining, and, honestly, it so is! YOU ARE DEADPOOL #1 never runs short on options for its readers to consider. As a result, the work is a consistent mode of humor and creativity, never having a single dull moment. So, if you are in the mood for a comic book that is totally innovative and even strange, YOU ARE DEADPOOL #1 could be the beginning of something that’s perfect for you! In the “Poison X” arc of X-MEN BLUE and VENOM, the teen Jean Grey became the unlucky host for a Poison: a parasitic alien creature that completely corrupts the bodies of its victims. According to Venom, there wasn’t any hope for her, since the minds and bodies of Poison victims are no longer human after becoming infected. Essentially, there isn’t a known way to bring back a Poison victim. Unless, of course, your name is Jean Grey. In VENOMIZED #5, Jean destroys the “Queen” Poison, thus killing all of the other Poisons. Writer Cullen Bunn and artists Iban Coello and Matt Yackey give Jean the only tool she’s ever needed: telepathy. Jean uses her enhanced telepathic powers to tap into every Poison’s mind. With all of those minds, Jean harnessed a huge amount of telepathic energy and sent it right into the Queen Hive. With the power she had left, she reconstructed her destroyed human body and returned with the other X-Men to Earth. Whether or not this reconstructed body is actually human is debatable. Jean questions her humanity at the end of VENOMIZED #5, but her teammates more or less ignore her. 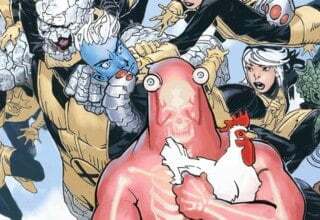 For Cyclops, he’s just happy to see Jean — even if it is a different, non-human version of Jean. It’ll be interesting to see whether Jean’s strange return has any impact on the future (or the pasts) of the time-displaced X-Men. Marvel has a lot of exciting new issues coming out next Wednesday, including X-MEN BLUE #27, RUNAWAYS #9, DOMINO #2, VENOM #1, NEW MUTANTS: DEAD SOULS #3, and so much more. Come back next week to see what we pick as the Unsung Marvel Moments for the week of May 9th!